Of the 8,400,000 species of life enumerated in the Vedas, two confront each other on the broad Australian plains. The feathered and the unfeathered biped regard each other across the vast gulf that separates their kinds. The emu, like all animals, must follow the ways of his species according to the dictates of nature. For him no question arises of what to do with his life; his purposes are fixed and invariant. But the human is set apart from the animals; he is developed in consciousness. It is not that the man is categorically different from his feathered fellow creature; alien though they may appear to each other, man and emu are kin. However divergent their bodies, each is a living soul, a fragmental part of the one supreme soul; as such the are of the same spiritual nature and are equals. Yet fate has cast them into diverse bodies. Here the human regards his own past, for a soul dwells in a human form only after evolving upward through all the species of life; on the cosmic time scale, the man has only recently shed his feathers. But now he has that which makes him unique—not a soul, for all life is soul, but a body in which the soul’s own consciousness is relatively uncovered. In this condition, the soul can ask himself: Who am I? Why am I here? Where did I come from, and where shall I go? What purpose or significance has my life? The ability to put such questions makes man different from emu, and the Vedas tell us that such inquiry—inquiry into ultimate meaning and truth—is the real purpose of life. 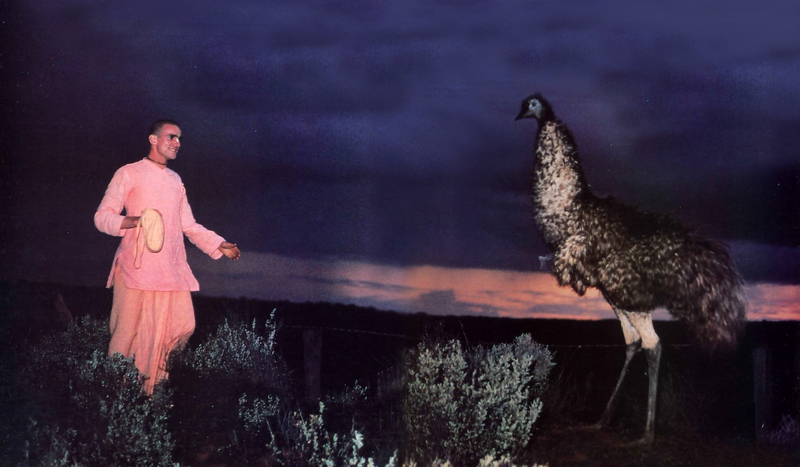 Unlike the emu, however, a human must pursue his purpose deliberately, consciously. This final step in the evolution of consciousness will ultimately free him from the endless repetition of birth and death in various species of life and liberate him into an eternal life of knowledge and bliss. 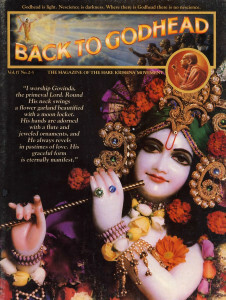 In fact, we see here a human being who has taken advantage of his opportunity, and even a little advancement on his path will save him from the worst danger—that of falling back down again into the animal forms. It is unfortunate that most humans no longer use their gift of developed consciousness. Electing to live like animals, they run the grave risk of becoming animals once more. Indeed, our feathered friend may be looking, all unknowingly, at the form is his long lost opportunity. But his time will come around again in due course. Meanwhile, those of us now in the human form shouldnot lose our rare opportunity to be truly human and so to become what we truly are: wholly spiritual beings, deathless, fully conscious, and filled with unending joy.